Images made by NASA's Chandra X-ray Observatory have revealed two distant cosmic construction sites buzzing with activity. This discovery shows how super massive black holes control the growth of massive galaxies in the distant Universe. Chandra's images of two distant massive galaxies show that they are enveloped by vast clouds of high-energy particles that are evidence for past explosive activity. In both galaxies radio and X-ray jets allow this activity to be traced back to central supermassive black holes. The jets are heating gas outside the galaxies in regions hundreds of thousands of light years across. Credit: 4C41.17: NASA/CXC/Columbia/C.Scharf et al. ; 3C294: NASA/CXC/IoA/A.Fabian et al. "These galaxies are revealing an energetic phase in which a super massive black hole transfers considerable energy into the gas surrounding the galaxies," said Andrew Fabian of England's Cambridge University, lead author of a paper on 3C294 to appear in an upcoming issue of the Monthly Notices of the Royal Astronomical Society. "This appears to be crucial in explaining the puzzling properties of present-day galaxies, especially those that group together in large clusters," he said. "It's as if nature tries to impose a weight limit on the size of the most massive galaxies," said Caleb Scharf of Columbia University, New York, and lead author of a paper on 4C41.17 to be published in The Astrophysical Journal. 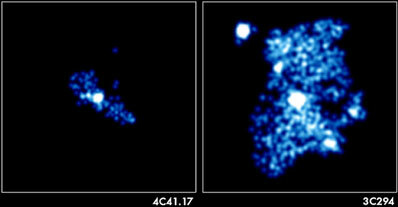 "The Chandra observations have given us an important clue as to how this occurs. The high-energy jets give the super massive black holes an extended reach to regulate the growth of these galaxies," he said. Astronomers recently used the Keck Observatory to observe these larger clouds, which have a temperature of 10,000 degrees. These clouds are leftover material from the galaxy's formation and should have cooled rapidly by radiation in the absence of a heat source. "Significantly, the warm gas clouds coincide closely with the largest extent of the X-ray emission," said Michiel Reuland of Lawrence Livermore National Laboratory, Livermore, Calif., a coauthor on the 4C41.17 paper and a paper describing the Keck Observatory work. "The Chandra results show that high-energy particles or radiation can supply the necessary energy to light up these clouds," he said. NASA's Marshall Space Flight Center, Huntsville, Ala., manages the Chandra program. TRW, Inc., Redondo Beach, Calif., is the spacecraft prime contractor. The Smithsonian's Chandra X-ray Center controls science and flight operations from Cambridge, Mass., for the Office of Space Science, NASA Headquarters, Washington.